One of the main things that has been lost in modern Christianity is the Main Thing – God Himself. The church invests millions of dollars in programming, high-tech equipment, buildings, and the like. However, what we need more than anything is to be drenched with the reality of the character, nature, and intimacy there is to be found in our relationship with God – especially as He has clearly revealed Himself in the Bible. Robert Bernecker has written a God-drenched book. He has written a book that tackles subjects as vast as the sovereignty of God, His providence, and our responsibility and will with reference to salvation and sanctification. The author tackles the “tough” doctrines of predestination, election, perseverance, and foreknowledge with theological precision, solid exegesis, and insight from 2,000 years of historical theology. Without getting bogged down in theological debate, Bernecker simply lets the chips fall where they may by giving a plethora of Scriptures on the deepest and profoundest issues of Theology Proper – the doctrine of God. However, not leaving the reader in the realm of the abstract but taking you into the intimate arms of our loving Father. If you want to understand the mind and heart of God and His will and purposes for humanity I highly recommend this book. It will give you a wonderful biblical theology of how God thinks and works in time and history – past, present, and future. 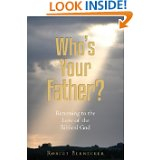 In reading this book you will develop a higher view of God, and of His amazing plan for humanity – and for you – the reader. I urge you to take up this book and read about our Awesome God as revealed in the Scriptures and take the plunge in the waters of being drenched and soaked in God’s glory. It’s what you and I need more than anything else!